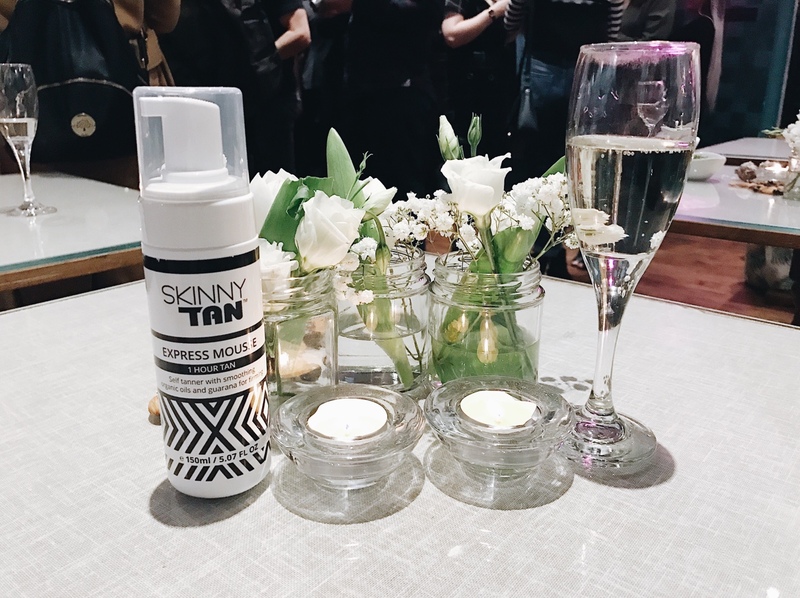 Last Wednesday I was lucky enough to be invited to the launch of Skinny Tan’s newest product, the express mousse! The event was in the beautiful Farm Girl Cafè, in Notting Hill – completely idyllic. Me and my very good friend Ashia, hopped on a train late Wednesday afternoon and made our way to Notting Hill. The Farm Girl Cafè is situated in the prettiest street, with all the typical colourful houses. Safe to say I was in my element haha. We were greeted by the lovely PR lady, Rosie, who invited me to the event, and the venue was super tiny, but very cute. This was my first ever blogger event, so I was super excited to see a few faces of bloggers I knew. One of the best bits, was the free prosecco, it was soo nice! Anyway, onto the mini review I have for you of the new Skinny Tan Express Mousse*. Theres quite a few tanning mousse’s on the market, but this is definitely one of the better ones I’ve tried out. Skinny Tan promises no streaks, and no biscuity smell. You can leave this on for up to three hours for a deep tan, or as little as one hour for a nice bronzed glow. I decided to go in the middle(ish) and leave it on for just over two hours. When first applied it smelt of coconut, which was so refreshing as a lot of tans have an awful smell when applied. It went on really easily, and then after around the two hour mark, I washed it off in the shower. Now, going back to Skinny Tan’s promise of no streaks, I can confirm that to be true. I did have a few really bad patches, but I know that was just due to my application and lack of exfoliation haha. As for the biscuity smell, unfortunately there was a slight lingering smell the day after, once it’d developed over night. But to be honest, I kinda expected that as I’ve never found a tan that doesn’t give off that smell once developed. Overall, I’m pretty impressed with the new express mousse and would recommend it. Also whilst at the event, we received a goodie bag of Skinny Tan products. I’ll just quickly mention what was inside, as I’m so excited to try them all out. I have the 24 Hour Bronzer, 7 Day Tanner in Ultimate Dark and the Pre Tan Primer. Thanks to Skinny Tan for the wonderful event, and I can’t wait to test out the rest of the products! Have you ever tried Skinny Tan before?